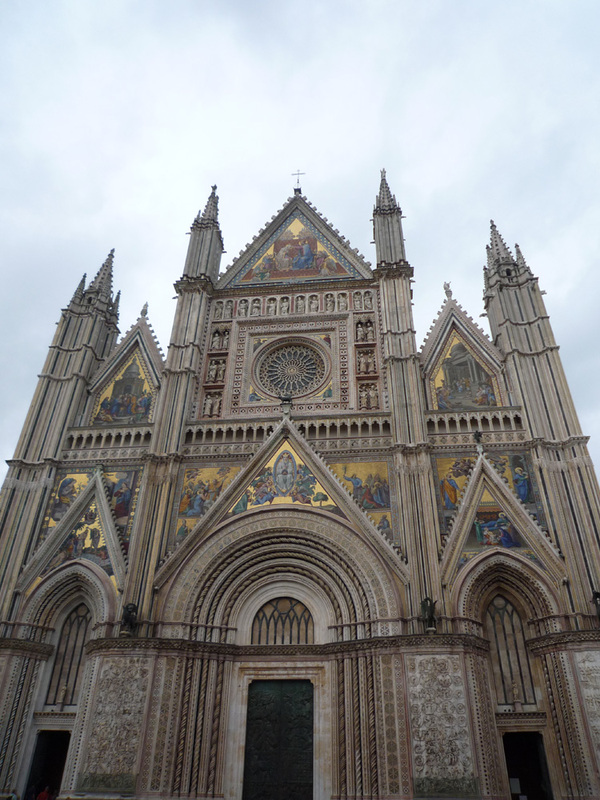 Legend has it that the Cathedral of Orvieto was built to house a relic that commemorates a miracle that did not happen here. The miracle of the Mass at Bolsena happened, you guessed it… at Bolsena, a town just 23 km away from here. In a church in Bolsena in 1263, a priest who was celebrating mass had doubts in the transubstantiation of christ,which is pretty much the most important mystery of the Catholic church. That is, he did not believe that the host (the wafer) used in the Mass was one and the same as the body of Christ. Well at the moment of consecration the host BLED and the priest stopped doubting. 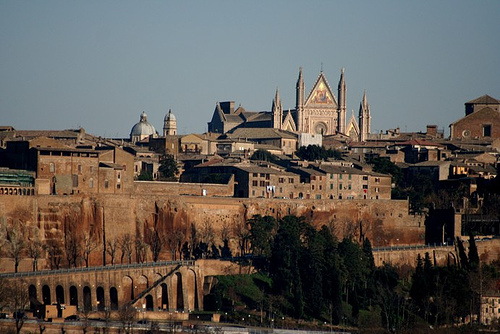 He wrapped the host in the corporal (the small piece of cloth upon which the wine and wafer holders rest) and brought it to the Pope Urban IV, who just happened to be in Orvieto at the time. The Pope declared this a miracle and established the Feast of Corpus Cristi to honor it. The relic of this corporal became the centerpiece of the new church, as it must have attracted pilgrims and lots of money. 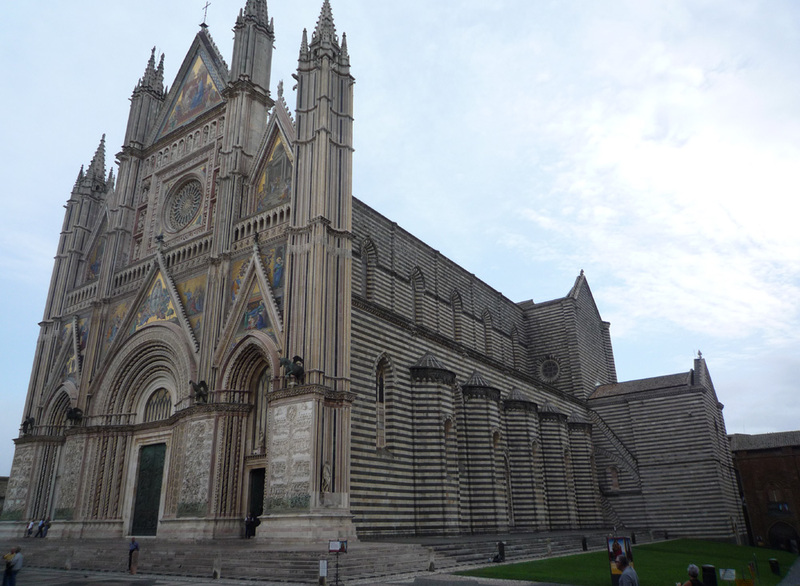 The cathedral is actually a unification of two earlier churches that were basically in ruins. The first designer and director of the works was probably Fra Bevignate, a monk from Perugia who we’ll meet again in Perugia as the designer of an important fountain. It was begun in 1290. 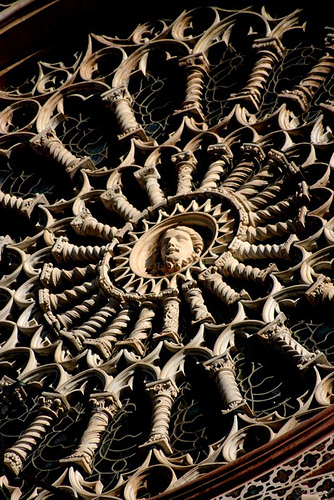 The impressive FAÇADE took about 300 years to complete, with mosaics and relief sculpture. It is like an architectural TRYPTICH – three part altarpiece – with three portals in correspondence with the nave and side aisles inside. The sculpture accentuates the structural elements while the mosaics accentuate the geometry of the construction. The INTERIOR is a basilican form, with side chapels in the side aisles. At the transept on either side are two important large chapels. On the LEFT is the chapel of the corporal that contains the relic. On the RIGHT is the Chapel of San Brizio with an important fresco cycle by Luca Signorelli (a Renaissance artist from Cortona). 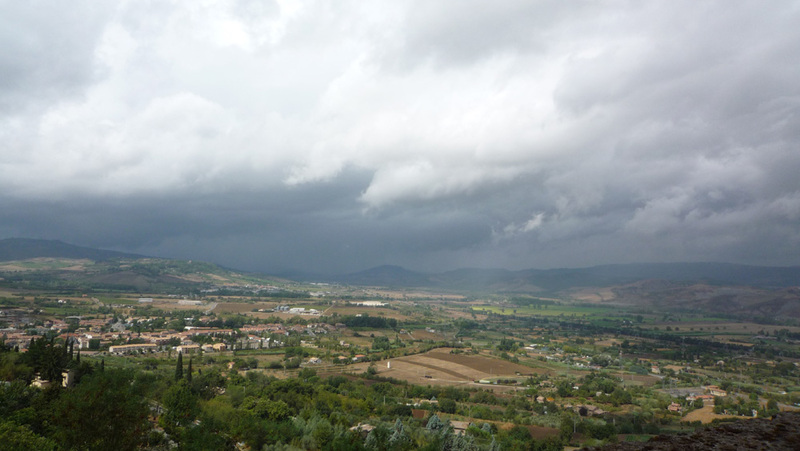 Orvieto is pleasant for a walk, especially if it’s less rainy and windy than the day this photo was taken. You can follow signs that say “passeggiata” (literally means “a nice walk”) which take you along the precipitous tufa walls that surround the city that sits 325 meters above sea level.